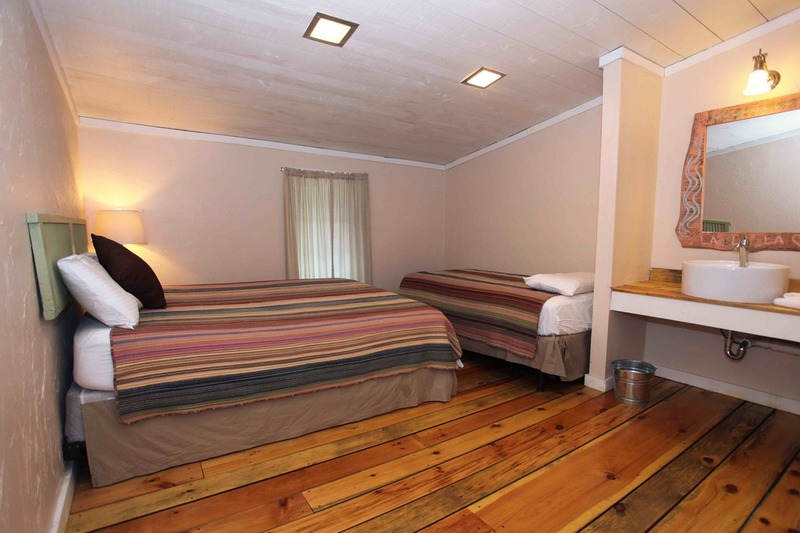 Suite 200 is a large, air-conditioned Queen Suite located on the second floor of the Trailside Inn, with a screened window facing the woods out back. 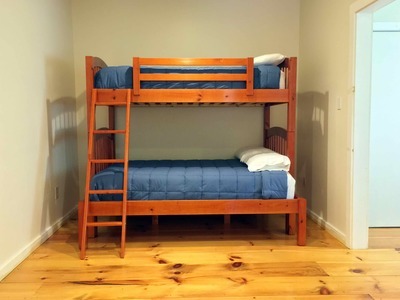 The room has wide-planked pine floors and features a queen bed with a hand-crafted wooden headboard, along with a twin over double bunk bed and kitchenette. 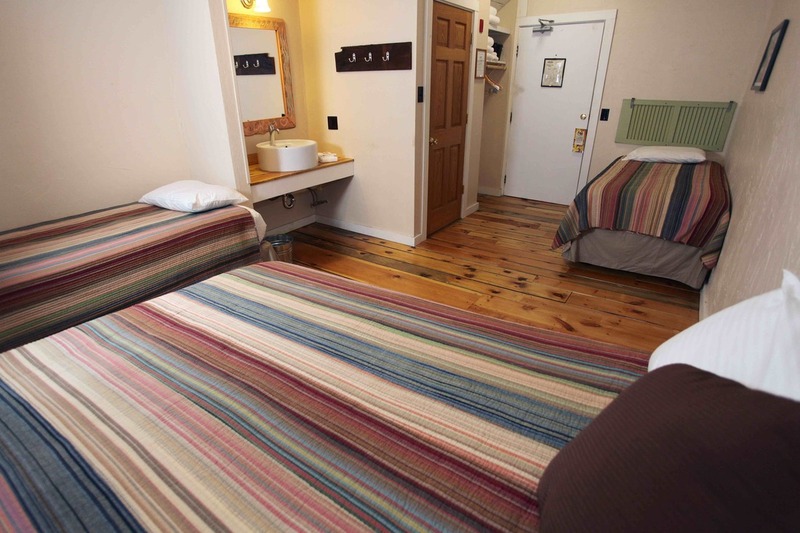 The suite comes equipped with a two-person sofa, full-length mirror, built-in closet, luggage stand, WiFi access, hair dryer, continental breakfast in the main great room, access to game room, and a generous supply of white fluffy towels. 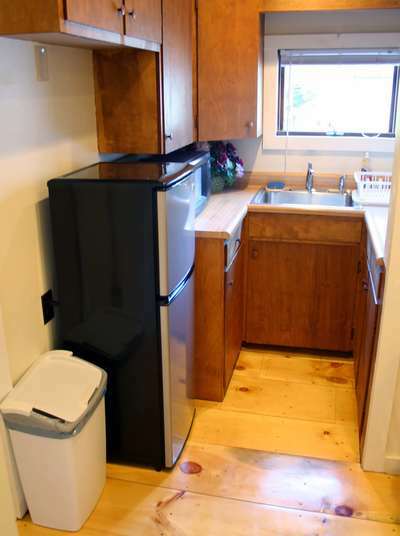 The kitchenette comes with table and chairs, fridge, microwave, toaster, and coffee maker. 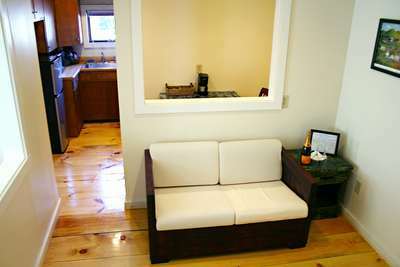 The suite has a private bathroom with a shower and bathtub. 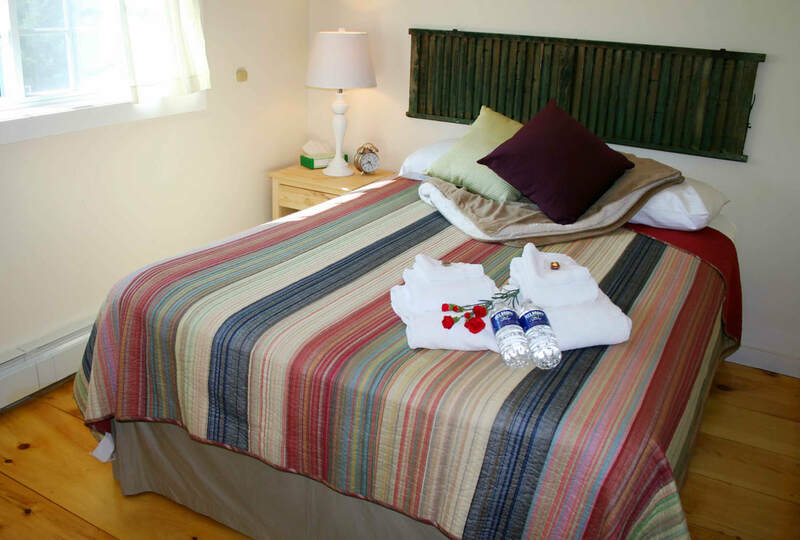 Suite 201 is a large, air-conditioned Queen Suite located on the second floor of the Trailside Inn, with a screened window facing the woods at the back. 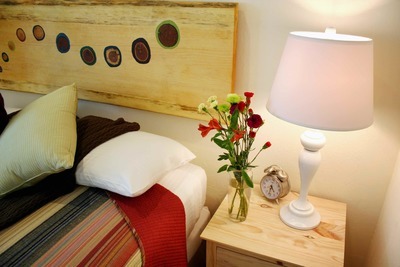 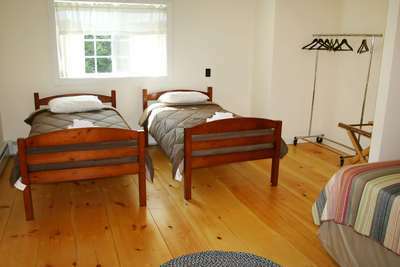 The room has wide-planked pine floors and features a queen bed with a hand-crafted wooden headboard, along with three twin beds. 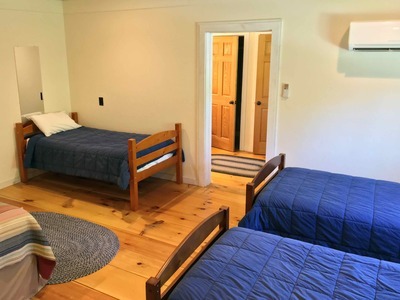 The room comes equipped with full-length mirror, coat rack, luggage stand, WiFi access, two large sinks with mirrors, hair dryer, continental breakfast in the main great room, access to game room, and a generous supply of white fluffy towels. 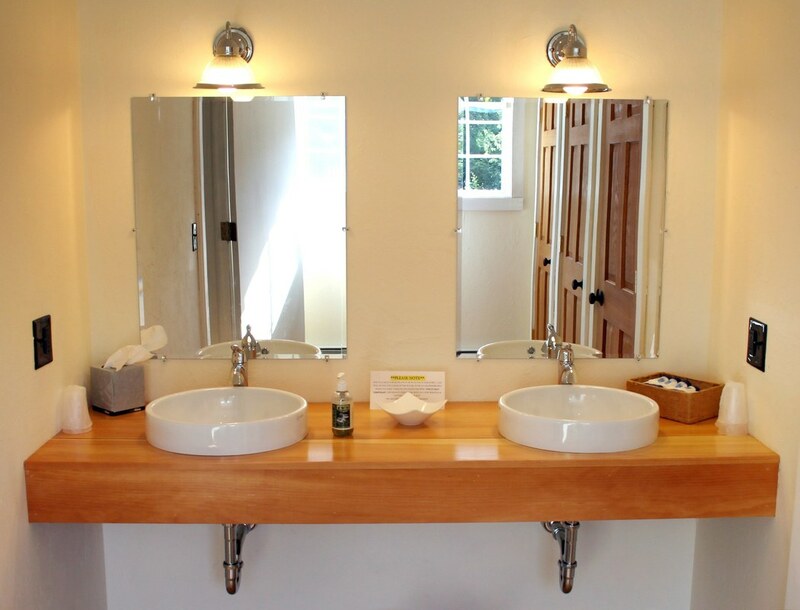 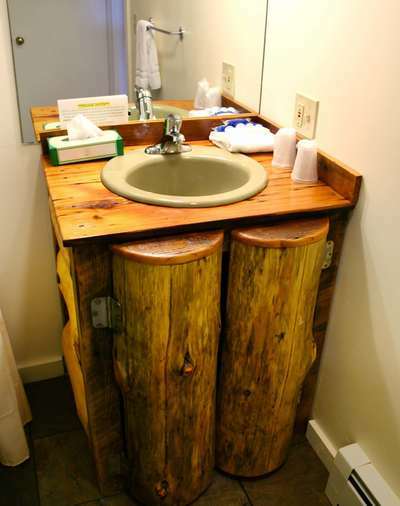 The room has a large private bathroom with double sinks and two separate shower rooms. Suite D1 suite features 1 Queen bed and 2 Twin beds. 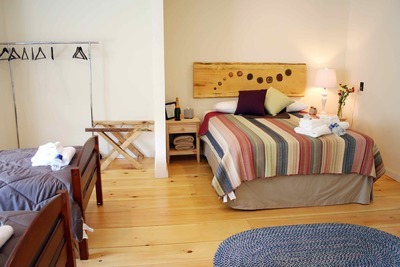 It is located on the main floor of the Trailside Inn, with a small screened window facing the woods at the back. 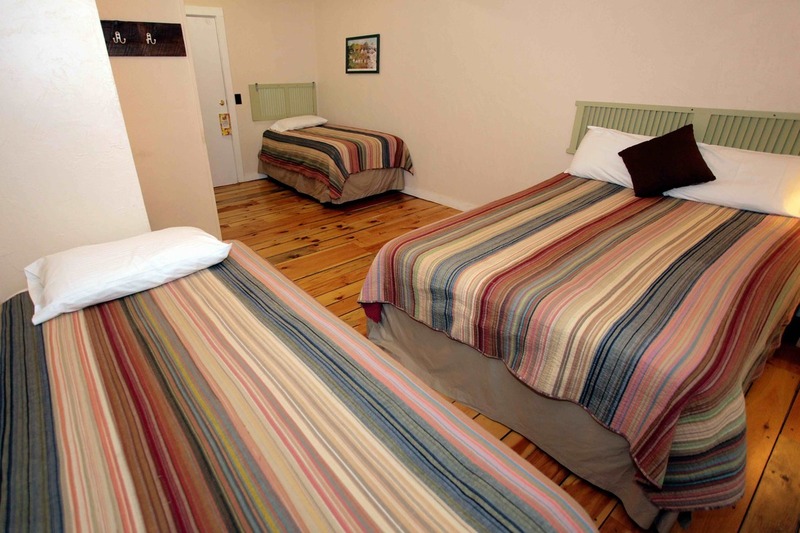 The room comes equipped with built-in shelving, coat rack, pedestal fan, WiFi access, large sink with hand-painted mirror, hair dryer, continental breakfast in the main Great Room, access to game room, a generous supply of white fluffy towels, and a private bathroom with a shower. ​Suite D2 features 1 Queen bed and 2 Twin beds. It is located on the main floor of the Trailside Inn, with a small screened window facing the woods at the back. The room comes equipped with built-in shelving, coat rack, pedestal fan, WiFi access, large sink with hand-painted mirror, hair dryer, continental breakfast in the main Great Room, access to game room, a generous supply of white fluffy towels, and a private bathroom with a shower.